If you haven't heard of a sneckdown yet, prepare to look at piles of snow and slush in a new way. 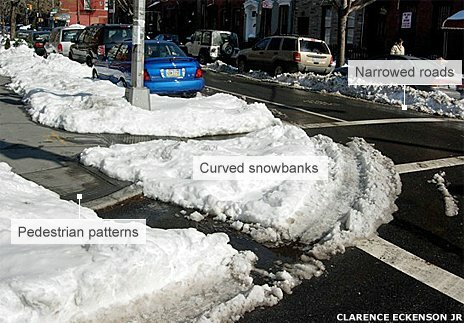 It's a combination of the terms snow, and neckdown (a neckdown is a term for pedestrian curb extensions). Snow acts like tracing paper on the roadways, showing the amount of space cars need to take a safe turn at winter speeds. Snow melts where vehicles make their turns, and the leftover snow provides visual indicators for potential curb extensions and pedestrian islands. View some of the pictures above and below to learn more about sneckdowns, or see some of our favorite posts about sneckdowns at Streetsblog or This Old City. Photo Credit: Clarence Eckerson Jr.